King of Gap Malaysia 2019. Vans China rider Xiao Ji appears in Vans global campaign together with legendary skateboarder Tony Alva. “I like colours, colours are everywhere and they inspire me, I’m inspired to do what I do and if you stay true to yourself you will have your own style!” - Xiao Ji, Vans China team rider. Legendary skateboarder Tony Alva explains why “Style” matters! NB# Asia just drop a promo video to celebrate the international Women’s Day. Leading by Margielyn Didal with her Teammate. Sunday Hardware Presents “Nine Men In The Pen”. Theeve Trucks Proudly Presents Nick Palmquists latest video part to celebrate the release of his pro model trucks. Outlanders, the newest skate video from Singapore. A 12 days trip to Guangzhou, Shenzhen and Hong Kong Skateboarders Amrien Karia, Christopher Van Huizen, Chris Toh, John Bringe Jophen Cha, Brian Don and Marcus Tay. Preduce X Masked Rider collaboration this Saturday, February 9th at Preduce flagship store and on preduce.com. The collaboration consists of a set of 5 skateboard decks, a t-shirt and 5 sets of skateboard wheels. Our art director and famed Thai street artist Thun “TRK” Puchpen designed it. He reinterpreted key characters of the Masker Rider series and placed them in front of a post apocalyptic Bangkok landscape. It’s the first time globally that Masker Rider is collaborating with a skateboard brand and each item are limited to a 100 pieces only. A curated clash of east meets west, this debut collaboration between adidas Skateboarding and Tokyo-based skate brand, Evisen, features essential silhouettes for any season, time or place. 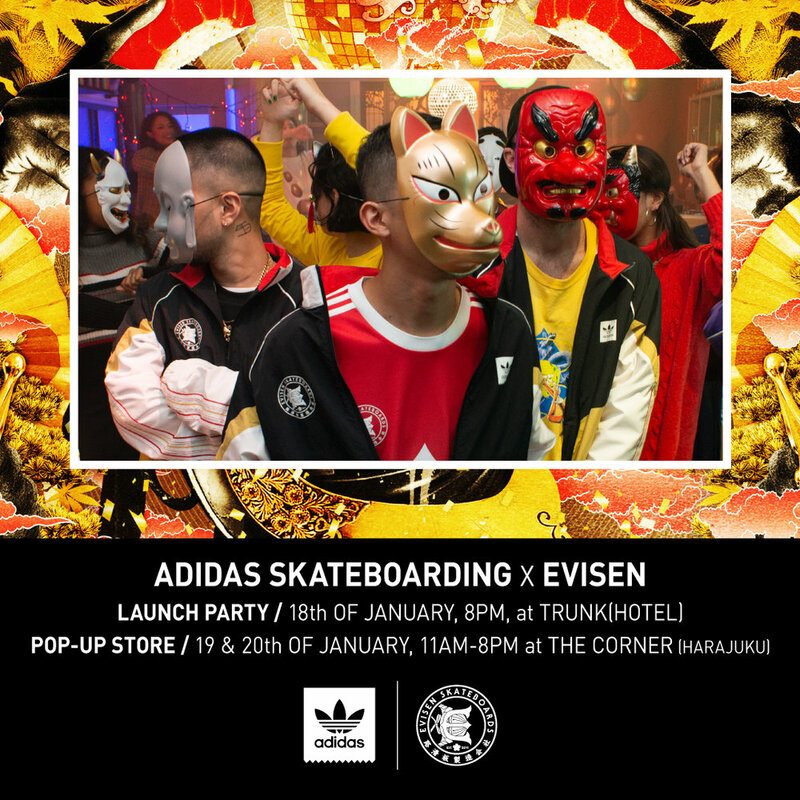 adidas Skateboarding and Evisen Skateboards has brought to you the first big product launch in 2019. If you are in Tokyo this weekend don’t miss it. Vans Malaysia just brought us their newest video “Sweet & Sour” featuring their new rider Fikri Fauzi (@fikrifauzi98) & Koya Miyasaka (@koyamiyasaka). Here in Sweet & Sour, they travelled to 3 countries to skate some of the most iconic spots in South East Asia and brought some sweet and sour memories back in this video! Pushing Myanmar presents 'Hmo Ka-Zun', an edit which documents a short trip to skate street in Mandalay and Pyin Oo Lwin. Featuring - Eirik Ballo, Ali Drummond, Bo Bo, Thurein Oo, Thant Soe and Soe Khaing Oo. Music - Track 1: 50 တန္ rap Track 2: May Myo Or Pyin Oo Lwin by Nwe Yin Win. Are you ready to check out these amazing skate spots in Shanghai through film maker Tommy Zhao and Liu Mao Mao’s eyes? Vans Asia rented a “Shikumen”, an old Shanghai lane house, for a month and invited the Vans team from all over the world to explore the city. Staying in week-long shifts, the team from the USA, France, Malaysia, Australia, Thailand, Indonesia, South Korea, and Japan cruised around with the Vans China team as they skated the city of marble, devouring xiaolongbaos and dodging scooters along the way. Featuring Chima Ferguson, Jesse Noonan, Jackson Pilz, Juwon Eun, Chris Bradley, Piet Guilfoyle, Azreen Azman, Dustin Henry, Etienne Gagne, Victor Pellegrin, Jeremy Hu, CK, Xiao Jun, Fifa Tintarn, Jerm Sothichai, Shogo Zama, Mario Palandeng, Zhenya Buzukin, Mike Lee, Justin Henry, and Pedro Delfino. Filmed and edited by Tommy Zhao and Liu Maomao. Check the B Sides from the production of the Vans Korea skate video ‘Cross Pollination’. Peep the in-between moments from skate filmer Hanmin Lee, who filmed Vans Korea rider Daeghun Ahn and a crew of his friends, for 1 year. Set to the background of Shanghai, "Shen City Peaks" captures Brian Peacock on his home court. With near infinite marble plazas to skate, Peacock delivers what some may call his official welcome to adidas Skateboarding video part. Sit back and enjoy the nearly six-minutes of ledge & manual wizardry with bonus clips from fellow team members Rodrigo Teixeira, Lucas Puig and more. Featuring: Brian Peacock, Lucas Puig, Rodrigo Teixeira, Jenn Soto, Mariah Duran and Stephen Khou. Vans Korea Cross-Pollination teaser #2. This is a one year project by filmer Hanmin Lee, The video showcases Vans Korea rider Daeghun Ahn ‘DGA’. Full video coming soon, stay tune! Watch out ladies and gentleman! Adidas brings the Das Days to the megacity Shanghai. A nine days straight event. Wandering will give out free magazines during the event, don’t miss it if you are in Shanghai. 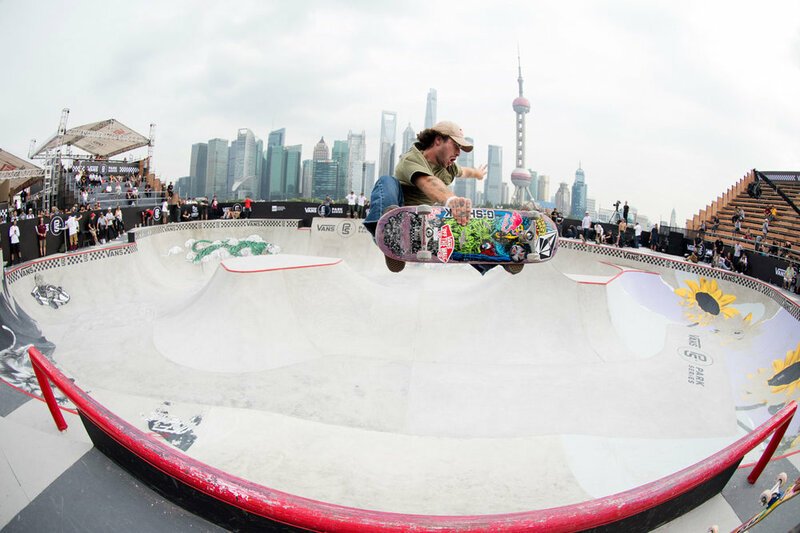 Vans is bring the Park Series Pro Finals back to Shanghai, China on October 27. Visit Adidas Skateboarding for more info. Here is Maru's part from the Evisen video. Enjoy your weekend. In celebration of two decades of working together, adidas Skateboarding & Mark Gonzales hosted Showcase X at Milk Studios in New York City to celebrate creativity and freedom of expression. Visit :http://adidas.com/skateboarding to see the limited edition footwear collection. Stronger, Harder, Last Longer? Preduce Skateboards just release their newest technology "SHL" deck to help you survive soi cowboy. Celebrating the release of the apparel collaboration of TBPR and abstract noise artist/rapper from ‘Black Smoker Records', Killer Bong. Shanghai PRO skater Jeremy Hu just release his new video part with Vans China. Our designer Jesper Lindgren just put out a full length video "DINAMO" for Rozzo Company. Featuring William Hall, Jamil Danielsson, Flemming Pedersen, Alex 'Plankton' Andersson, Birdgang and The Paisanos. Qin Huang Island held the first skate contest in China 25 years ago. There is nothing in between till Street Force brought the contest back last week, here is the recap video. Filmed by:Tommy Zhao, Liu Haoxuan, Wang Xin, Zhang Ran. Edited by: Tommy Zhao. Visualtraveling presents - The Eurasia Project Trailer #1. Book releasing in June, stay tune. The Quiet Leaf Issue #6 is coming soon. This issue is about Spain and it features Raul Navarro, Pedro Attenborough, Javier Sarmiento, Enrique Lorenzo, Daniel Lebron and Jesus Fernandez. Another Day to the Streets is a photobook by Mohd Azim Nong known as Ajiem Serr. This photobook highlights the skateboarding scene in Malaysia. This book will be released at White Box Publika on 11th May 2018. Another Day to the Streets will be available for purchase at White Box Publika on the release date or directly through Ajiem. Contest close on 11:59 pm 15th May 2018 🕛 (Beijing time). Wanna see something different? here you go! Check out Koichiro Uehara's part from the Evisen video. Thailand finest skateboard company Preduce Skateboards just put out their six full-length video "SuperMix". Don't miss out!! Postcard is proud to premiere ‘Via’ a visual journey showcasing footage captured in over a dozen countries to show you what gets us out of bed every morning. Postcard is a production house based out of Asia and established by master lens-men Patrik Wallner and Tommy Zhao. Postcard is proud to carry over a decade of experience traveling to unique places like the Horn of Africa, the last Jellyfish Lagoon in Borneo, sitting on 72 hour train rides in Kazakhstan and climbing the Caucasus mountain to film action sports, independent documentaries, and commercial work for brands like Adidas, Red Bull, Vans, Beats by Dre & more. Preduce Skateboards "SuperMix" Tokyo Premiere, If you are in town, don't miss out! “Gong Xi Fa Chai! Happy Chinese New Year from New Balance Numeric. Follow the brand new @nbnumericasia to see what is going on all across Asia Pacific. Video edited by Anthony Claravall. Filmed by:Anthony Claravall, Tommy Zhao, Dani Bautista, Janchai Montrelerdrasme. Skater: Dan Leung, Jasper Dohrs, Sanggoe Dharma Tanjung, Demit Cuevas, Mak Feliciano. Evisen Skateboards is welcoming Shor West to join the team. Get ready to see some raw skateboarding here! Kaito Sagawa is now pro for IFO Skateboard. Evisen Skateboards first full-length video trailer #2. Vans APAC team transit video series "Be like water". IFO Skateboards Second Full-Length Video "Second Cosmic Velocity". Sandwich Layer Hawaii Tour Photo Gallery.